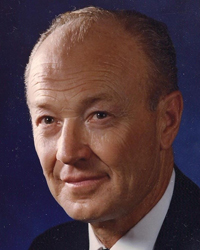 Floyd A. McCracken passed away peacefully at home on Nov. 16, 2013. He was 83 years old. He was born in Seattle, Wash., on July 9, 1930; the middle of three siblings, Dorothy (Marcus) Hermanns and Lawrence (Jennifer) McCracken. He attended East Mercer Island Elementary School, and in 1948 he graduated from Queen Anne High School, where he played football and was elected class president. He joined the U.S. Air Force in 1949, and after one year of active service, enrolled at the University of Washington. He joined the Sigma Nu Fraternity where he was elected president. He was honorably discharged from the Air Force in 1953, having reached the rank of second lieutenant. He graduated from the University of Washington in 1955 with a Bachelor of Arts degree in Business Administration. Floyd moved to Arizona in 1957, where he became licensed as a stock broker—a career he would maintain until retiring at the age of 75. He was always involved with a wide range of social and service organizations, including the Boy Scouts of America, Planned Parenthood and the Arabian Horse Association. He was president of the Unitarian-Universalist Church of Phoenix from 1966 to 1967. In 1970, he entered the race for state Senate of Arizona. He was active for many years in the Rotary Club and the Masonic Lodge. He was elected president of the Sedona Rotary Club, and Master of the Sedona Red Rock Memorial Masonic Lodge. In Sun Valley, Idaho, he founded the Historical Society, and helped save poet Ezra Pound’s original home, which was preserved and moved to a new location. He was named “Citizen of the Year” in Sun Valley for his many contributions to that community. He also had a lifelong affinity for music. He played trumpet and clarinet since high school, and loved the live music scene. Over the last 30 years, he was president of the Verde Valley Concert Association; sponsor chairman of the Sun Valley Jazz Jamboree in Sun Valley, Idaho; president and founder of the Sun Valley Opera; and member of the board of directors of the Seattle Musical Theater. In October 2013, he completed his 23rd consecutive year as announcer and presenter at the Sun Valley Jazz Jamboree. Floyd packed enough activities and friendships for several lifetimes into his 83 years. He is survived by sons Scott A. McCracken and William F. Patterson; daughters Janet E. McCracken and Marian Giannatti (Don); and grandkids Alissa, Billy, Dorian, Elizabeth, Isabel, Michaila, Shanna and Trace, as well as three great-grandchildren. He will be greatly missed. A private ceremony for immediate family was held on Saturday, Nov. 23, at Messenger Mortuary in Scottsdale, Ariz.